It’s a step by step movement from Wendy Shay with the best of music. 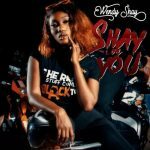 The female act signed to RuffTown Records released her debut album on the 20th of December, 2018 and it was captioned Shay On You. Surprisingly, the title of the album is also a single on the album.